WUHAN, November 05, 2015 – Hebei University has been learning, observing, and practicing the otherwise brand new concept of US-style football for about 28 months. When the team that calls itself Nirvana (How does that work? The Nirvana are in field goal range? 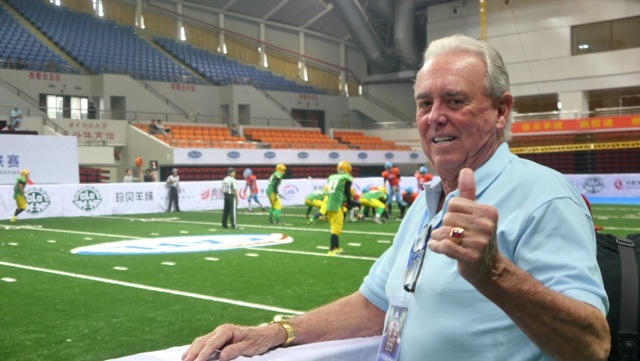 ), took the field Wednesday afternoon at the Guanggu Gymnasium in Wuhan, Hubei province’s capital city, it was obvious that the young aspiring stars of China football had learned quite a bit from the first ever CAFL-sponsored tournament held a year ago in Beijing. The team in light blue and orange (interesting) that finished just one win short of the championship a year ago, had improved so much the only thing in doubt was the final score. Could the Hebei Nirvana win the first game of the 4-day tournament in a whitewash, a shutout? Their defense had been stout. In the final minutes Pirates (whew) of Tianjin were driving. Hebei dug in. When the young defensive back intercepted the pass deep in his own territory after a diving, twisting catch, he darted into the end zone and spiked the ball in celebration. One problem – either disoriented from the acrobatic play, or hyperventilating from excitement, he had spiked the ball in his own endzone. Complete with a victory dance celebration. Two points on the board – for Tianjin, their only points. Live and learn, which is exactly what is happening here on a daily basis. Welcome to opening day at the DeHang Bowl, a 4-day 9-game round robin event featuring the six sports universities playing arena-style US football here in China. 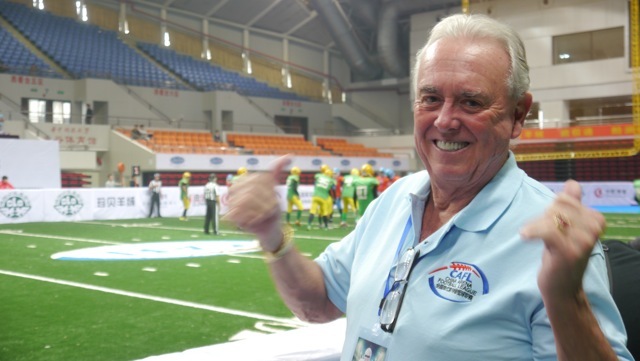 Marty Judge, the Runyonesque swashbuckling millionaire from the row houses of Philadelphia, is back for his estimated 35th trip to China in search of his personal Holy Grail, a professional football league here. “I am back, and feel like a little kid at Christmas, that’s how excited I am,” he told the enthusiastic crowd of spectators, VIPs and all six teams that had gathered on the turf for the opening ceremonies inside the modern arena near the campus of the home-team Wuhan University. 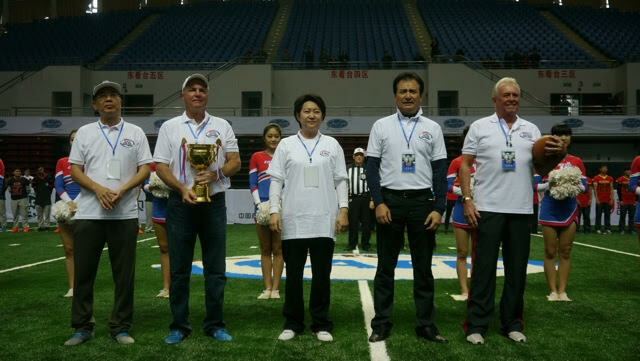 Ceremonies are important in China, and the CRFA (China Rugby Football Association) was here to observe. Judge’s core operating team have worked hard and persistently for four years to get the confidence and support of this Chinese government sports agency. It seems to be working. The CRFA’s official, Chairman Li has apparently become an avid fan of his new sport. Chairman Li spent more than five hours at the two games on opening day of play – not sitting among his fellow VIP’s in a special seating section – but roaming the sidelines on his own. An avid photographe,r Li proudly showed me the hundreds of digital photos he had captured with his new Nikon super-zoom camera. It’s all part of this unlikely, colorful, internationally diverse group that Marty Judge has cobbled together to help him live his dream. “What I’m doing here will make the world take notice. And it will happen fast. The timing is right. The younger generation is gobbling up the western culture right now, and what is bigger in the west, than sports – than football?” explains Judge, thrusting his left fist skyward, his trademark exclamation point, complete with infectious smile. Tomorrow, my notebook (“Lou’s Views” ), and my observations of the players, coaches, fans, cheerleaders and more.